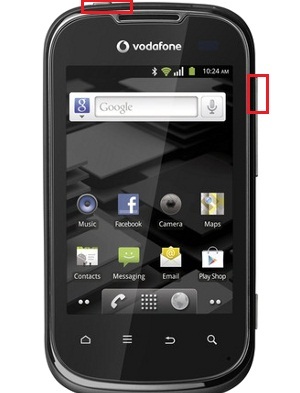 The Vodafone V860 Smart 2 is a smartphone produced exclusively for Vodafone, released in June 2012, which features a TFT capacitive touchscreen with a 320 x 480 pixels resolution. Although being an appreciated phone due to its features and low cost, if you happen to own this phone and begun to notice it’s not working properly, is necessary to perform a hard reset to factory settings. Restoring the Vodafone V860 Smart 2 to default settings helps you solve persistent problems in your device functionality, it freezes easily, and it moves slowly, it appears different error messages or some application refuse to respond. Also, all your personal data from internal phone storage such as information about Google Account, any other accounts and downloaded applications will be deleted. So, don’t worry to backup your data. Also, the Vodafone V860 Smart 2 is equipped with a Li-Ion battery that features a talk time of 9 hours, it runs on Android and comes with a processor of 832 MHz. The back camera can take photos with 2048 x 1536 pixel resolutions, while the video resolution of the front-facing VGA Camera is 640 x 480. Turn off your phone and hold the Volume Up +Power On/Off keys at the same time. Press these two keys at the same time until the phone is switched On and release only Power key but continue to press Volume Up key when you feel it vibrates. When a green droid appears on the screen, release the Volume Button. In the newly appeared menu you can navigate using the Volume buttons. Scroll to Factory reset/wipe data using volume down key and then press Home to Confirm. In the end, choose reboot system now.